Bugbear is a mass-mailing and network worm with keylogging and backdoor capabilities. 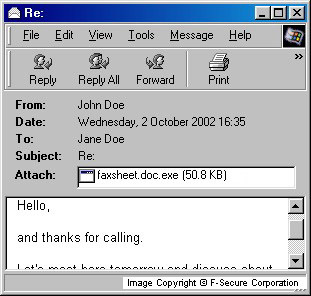 It appeared in the wild on 30th of September 2002. CAUTION Manual disinfection is a risky process; it is recommended only for advanced users. To remove Bugbear worm from a system it's enough to delete all its files from a hard drive and to restart a computer. If the worm is in a network environment, the network should be temporarily taken down and all systems have to be disinfected separately. Otherwise the worm will try to re-infect already cleaned systems. Also after disinfection it is recommended to change all logins and passwords as they could have been compromised by the password stealer component of the worm. It is also recommended to check infected systems and networks for possible hacker intrusion that could have been performed through the backdoor component of the worm. F-Secure is downgrading the Bugbear/Tanatos email worm from Level 1 to Level 2 as it is not spreading as fast as before. It also drops a keylogging component as a DLL file with a randomly-generated name (ZLQPUPP.DLL for example) to Windows System folder. The worm also creates 2 more DLL files and stores some encrypted data there. The worm creates 2 randomly named DAT files in root Windows folder too. The worm's file is a PE EXE (portable executable), 50688 bytes long and it is compressed with UPX file compressor. Bugbear spreads in email messages as an attachment with randomly-generated names and with one or more extensions. Subjects and bodies of infected emails are also different. The mass-mailing routine is quite complex. The worm has the ability to fake information in email headers, so sometimes the sender's email address gets replaced with another address that the worm finds on an infected system. Bugbear has local network spreading capabilities. The worm enumerates network resources and tries to locate \Start Menu\Programs\Startup\ folder on remote systems. If such path is found, the worm copies itself there with a random name. When a remote system is restarted, the worm's file gets control and infects a system. The worm uses separate routines for process killing on Windows 9x- and NT-based systems. In most cases the worm effectively disables security and anti-virus software that fail to detect it entering a system. Bugbear worm also listens to port 36794 and can provide access to an infected system and the network it is connected to via an internal backdoor component. The backdoor component allows an attacker to access an infected system through a web-based interface. The worm generates HTML pages on-the-fly when an attacker browses directories on an infected remote computer. It contains several icons that it uses to identify the type of remote drives and files. 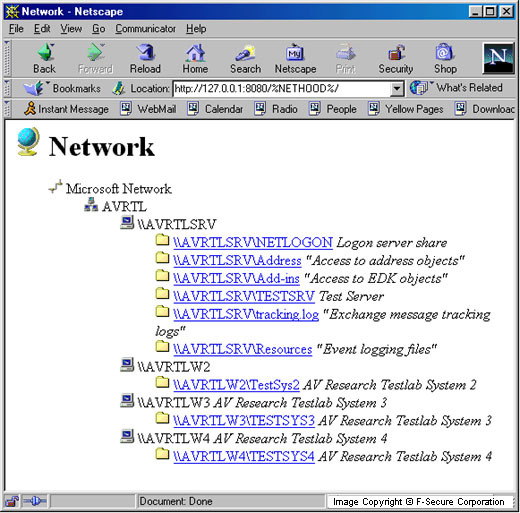 The backdoor component also allows to browse shared network resources that an infected computer has access to. 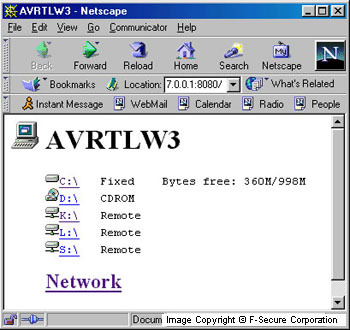 The worm also uses icons to identify network resources. Bugbear allows an attacker to get information about the infected system: operating system, processor type, fixed and network drives. The worm has password stealing capabilities. It installs a keylogging component to a system, records keystrokes and saves them into a file. Then it sends this file to a few email addresses that are stored in encrypted for in the worm's body. The smtp server names that the worm uses to send the files are also stored in encrypted form in the worm's body. According to reports, network printers start to print a lot of garbage when the worm infects a network. This might be the side-effect of the worm's attempts to infect a network.